What are the benefits of tracking your YouTube channel with Google Analytics? Choosing to track your YouTube brand channel with Google Analytics allows you to keep track of the visits to your YouTube channel. You can also learn how those visitors came to your channel, how often they return and how much time they spend on your channel. In addition, Google Analytics shows you the geographical location of users and what language they speak. At the moment it’s only possible to link Analytics to a brand channel. If you don’t have one of these, you can still use YouTube Insight, available to all users, to see various video metrics. First things first, you’ll need a Google Analytics account. If you have this already then give yourselves a pat on the back. If not, it’s really easy to sign up. Once you’ve logged in you have the choice of either creating a new account for your YouTube channel or creating a new profile within an existing account, for your website for example. YouTube recommends creating a new account because they say this will prevent YouTube data from impacting on data summaries from other websites, although Search Engine Land recommend the opposite because they say that it will allow you to view the stats for your YouTube channel together with those of your website or separately. It’s a case of deciding which would be best for your own brand. Once you have created your new Google Analytics property, the next step is to grab your Google Analytics Profile ID, it looks a bit like “UA-123123-1″. You’ll find it in your account Overview, listed with the website profiles. 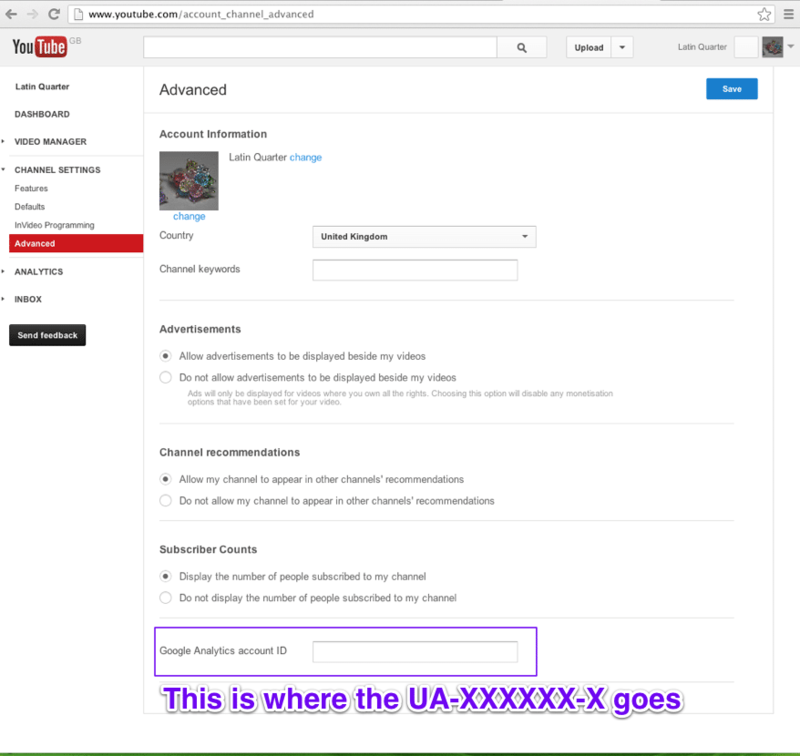 Once you’ve got your ID, go into your YouTube advanced channel settings and paste it into the Google Analytics Account ID field before saving changes. This link may help you find this page. Now your channel is linked to Google Analytics, although it can take up to 24 hours for your data to start showing up. So why should you track YouTube with Google Analytics? Apart from the benefits listed above, analysing the data will help you to guide future decisions and optimise your videos to reach your audience. Analytics offers you valuable insights into how your audience have responded to your videos. It’s an important part of your marketing strategy to be able to measure ROI. How else will you know if what you’re doing is working? Why connect your YouTube channel to Google Analytics of course! Go on, you know you want to. Also, if you are think of doing video advertising, such as promoted videos or pre-roll, you can also use the interface where you will be able to link your YouTube channel with AdWords. We’ll likely write another blog about that in the future.